Lord’s 1982: Pakistan’s target to win the Test is a simple 76. Pakistan don’t do simple. They do complex and unfathomable. It’s the final session of the Test and rain clouds rush towards St John’s Wood. Pakistan last won a Test in England 28 years earlier – Fazal Mahmood’s match at The Oval. This win can shape history, be a catalyst for Imran Khan’s new age. A win at Lord’s, to follow humiliation in 1978 – and if there is one thing Imran can’t stomach, it’s humiliation. His every cell has pride stamped on it. This win will be a manifesto for pride-branded cricket. Yet the rain clouds are gathering and only 15 overs remain. Pakistan’s opener Mudassar Nazar holds the record for the slowest Test hundred. He doesn’t appear, left in the pavilion to be satisfied with his surprise six wickets in the second innings. Imran places history in the hands of Mohsin Khan, to follow his dashing double-hundred in the first innings, and Javed Miandad. The rain clouds are in a rush, but Miandad and Mohsin are more urgent, scampering singles and thrashing boundaries. Pakistan win by ten wickets. Javed kisses the turf and runs for the pavilion. We are in the time of pitch invasions, and where better to sprint in triumph than at Lord’s? Imran smiles for his statement victory. England are back at full strength at Headingley to narrowly take the series. But nothing takes the edge off that first win at Lord’s. Nothing. Lord’s is the home of cricket and the ground to make history for England’s opponents. Pakistan will never look back. A decade later, another chase at Lord’s is important. Pakistan are the ODI world champions. Winners over England at the Melbourne Cricket Ground in March, an iconic final in the history of one-day cricket. Wasim Akram’s final, where he scores quick runs and conjures incredible wickets, blowing a hole in England’s soul. In these undifferentiated days, the status of world champions in one-day cricket somehow implies superiority in Test cricket too. Pakistan feel the pressure of tackling their vanquished rivals so soon, of defending their world standing. In any case, this is England. And this is the home of cricket. That’s pressure enough. Pakistan’s captain, Miandad, knows all this and he has his pride too. The pride of Karachi, of never taking a backward step. Pakistan’s hunt a second series win in England, after winning their first in 1987. An unlikely alliance of Headingley and Saleem Malik, backed up by Imran’s ten wickets, delivered that series. But Imran is now gone, a victim of age and a feud about the World Cup spoils. Miandad is captain on the team sheet rather than by proxy. It’s the fourth day and Pakistan require a simple 138 to win. Nothing is simple in Pakistan cricket. They find themselves at 95 for 8, with Wasim and Waqar Yonis at the crease. The two Ws believe they’d won the match once, sharing 13 wickets as we fall in love with reverse swing – and England possess the might of Gooch, Stewart, Hick, Smith, Lamb and Botham. Now the two Ws must win the game again, with the bat this time. Love’s labours lost. This match decides nothing except first blood in the series. But every match for a former colony at Lord’s is a judgement, on how we are and how far we’ve come. And we’ve come down to this, 43 required with two wickets in hand. Only Aaqib Javed to come. At the ground, people are frozen rigid in their seats. At home, people are sucked into their televisions. The fate of the world hangs on this, at least it seems to. Pakistan don’t lose another wicket. Pakistan don’t lose. Wasim crashes a lavish four to the cover boundary, grabs a stump and sprints for the pavilion. He’s met halfway by team-mates, and ecstatic fans, carried aloft like the King of Lord’s. England play a perfect game at Headingley, but Pakistan decide the series at The Oval. Pakistan almost win by an innings and no Pakistani scores more than 59. Fifteen wickets to the lords of reverse swing. Pakistan aren’t just world one-day champions. They are more than that – and Lord’s plays its part. By 1996, England are no longer feared. It is Pakistan who are feared, with their world-class opening bowlers and mystery spinners. They can bat too. This is the most complete Test team Pakistan cricket have ever known. Nothing is simple, for sure. They are successful but not quite as successful as they might be. And there are reasons, some that only emerge later, for why the chaos keeps boiling over, why the genie loves to escape the lamp. The first Test is at Lord’s and Pakistan dominate. Inzamam-ul-Haq and Saeed Anwar are formidable in a team at its peak. Nothing is simple, though, for Pakistan cricket. They dominate at Lord’s but the result is in doubt. England are holding on, rather too easily, at 168 for 1 on the final day chasing 408, with Michael Atherton and Alec Stewart at the crease. The game is a draw, a nailed-on draw. And then it happens, the deep magic fills the ground. 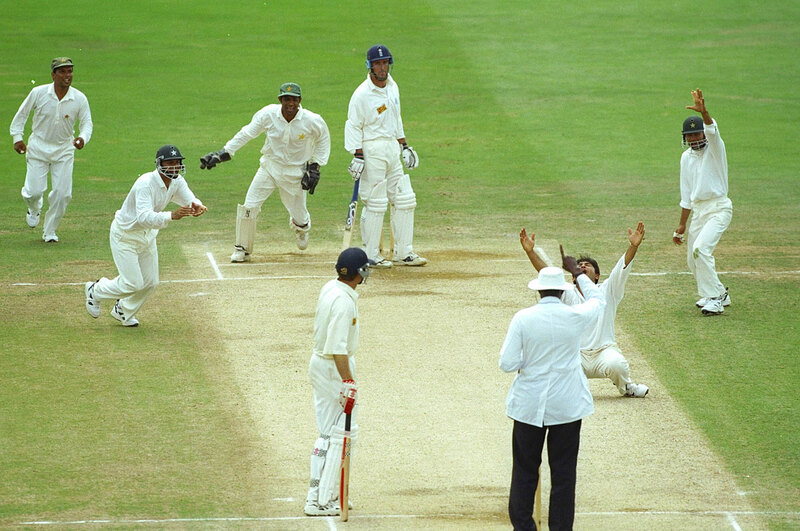 Waqar charges down the slope, Mushtaq Ahmed skips and twirls his variations. Extreme pace from one end, swinging in at the stumps, a legspinner casting his spell at the other, the battle rhythm of Pakistan cricket is scattering England’s senses. With each wicket, Waqar charges in faster, bowls it quicker, swinging it more and later. Each war cry from him is louder and more victorious. The stumps are his. England are gone for 243 and Pakistan win again at Lord’s, this time by 164 runs. The Oval seals the series. A fine win by nine wickets. This Pakistan is too strong for this England. And Lord’s played its part, settling the mood, making it three wins out of four for the men of Pakistan. Two decades later, the world is changed. The revolution a distant memory. The heroes gone; 2000, 2006 and 2010, the intervening England tours, produce no wins at Lord’s, and only a decline in standards. The year 2000 is the twilight of the idols, a drawn series through luck and the weight of history. Then 2006 brings a team that can bat in parts but betrays its bowling traditions. It also brings the rule of Inzamam, with the assistance of the Bob. It brings The Oval and Darrell Hair and the forfeit. But 2010 is worse. A batting side of horrible inexperience, a camp of distinct immaturity, and the scandal of no-balls. Cricket is finished in Pakistan, perhaps Pakistan cricket is finished? Yet this is Pakistan, and nothing is simple or easily fathomable. Pakistan is not weak. This Pakistan team is strong, save for its openers. The strongest, hungriest Pakistan team to visit England since 1996. The most complete Pakistan team to visit England except that team of 1996. How they did it is written in these pages. The will of Misbah-ul-Haq and the grit and guile of Younis Khan. The discovery of Asad Shafiq and Sarfraz Ahmed, two of Pakistan’s most accomplished players in their respective positions. The pace of Wahab Riaz, that wild, raging power that summons the magic of reverse swing. The revelation of Yasir Shah, a legspinner in the tradition of Abdul Qadir and Mushtaq, perhaps better than both, and in tandem with the pace bowlers beating the battle rhythm of Pakistan cricket to scatter England’s senses. And then at Lord’s the resurrection of Mohammad Amir, the bearer of the flame, the next great Pakistan fast bowler. Nothing is simple in Pakistan cricket. This isn’t the wild, electric, ill-disciplined Pakistan of yore. This is a new Pakistan, a second revolution. This is a revolution of patience and discipline, of dot balls and boot camps. A Pakistan that stokes wildfire and electricity but confines them within a calm embrace. This is Pakistan’s fourth Test win at Lord’s. Each win is the stuff of legend, but that is the nature of Lord’s. It would be too simple to say each win matters as much as the others. Nothing is so simple in Pakistan cricket. Up until now, Imran’s 1982 victory was the greatest, but it was coming, Pakistan were a team whose moment was about to arrive. In 2016, 34 years later, Pakistan cricket has given us unparalleled highs and bottomless lows. No series victory in England for 20 years. So many bad times that the good times were almost forgotten and unimaginable. A Pakistan team has never approached a Lord’s Test under such scrutiny, this unsure of its worth outside Asia, and against an opponent flying so high. What to expect was hard to fathom. Yet Pakistan mastered the pressure. They mastered the circumstances. They delivered the greatest Lord’s win, but they didn’t sprint off the pitch. They paused in front of the pavilion for a salute and press-ups to pay respect to their country and their countrymen. This is a second a revolution in Pakistan cricket. A revolution of pace and fire. A revolution of mesmeric spin and dedicated batting. A revolution of deep magic and battle rhythms. Above all, this is a revolution of respect.